Metaproject 08: Industrial design students re-imagined how dinner out could be interpreted as part of the most recent Metaproject. They created a pop-up restaurant within Good Luck in Rochester. By partnering with industry, RIT’s industrial design department’s Metaproject teaches students the role of research at every stage of the design process. After eight years, this senior studio has proven itself to be a successful vehicle for fostering innovative thinking and thoughtful product design. 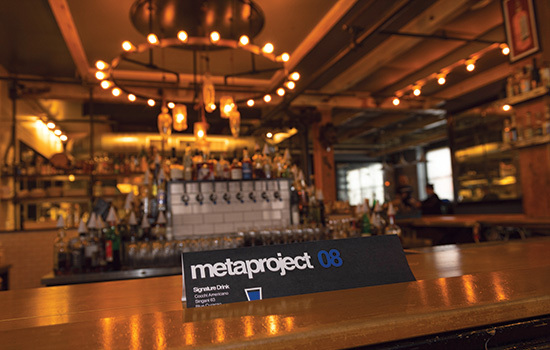 Metaproject is the brainchild of professor and chair of RIT’s industrial design department Josh Owen, who came to RIT in 2010 just as the Vignelli Center for Design Studies was coming into being. “I wanted to create a bridge between the newly completed Vignelli Center for Design Studies and the industrial design program. I hoped to leverage the assets of the Vignelli Center to help teach fundamental design lessons. With the Metaproject I would create a platform for students to collaborate with design-centric industry partners of the highest caliber,” said Owen, who chooses one company each year for his senior design studio to partner with. After more than 20 years as a professional designer and professor, Owen, who has worked around the world, has been able to connect RIT with such powerful brands as Wilsonart International, a creator of laminate surface materials; the Corning Museum of Glass; Areaware, an avant-garde accessories manufacturer; Herman Miller, the iconic furniture maker; Kikkerland, which manufactures products for a variety of consumer markets; Poppin, a maker of unique office products; and Umbra, a Toronto-based housewares manufacturer. Most recently, the students worked with Rochester’s Good Luck restaurant on a unique experiential—rather than product-based—project. Students research, design, develop, test, and ultimately build their responses to the issue they’re tasked with. Their projects are critiqued by the industry partners then often ranked into winners and honorable mentions. All this happens within the confines of the fall semester; in the spring the group exhibits at the International Contemporary Furniture Fair (ICFF), held annually in New York City. In 2016, RIT’s Metaproject 06 was chosen from 14 university participants to win the Editor’s Choice Award for its show exhibit. One thing that sets the project apart is its branding—the typeface, color palette, the press-quality photography, the 100-page published book that collects the output—it announces itself to the world as much more than a senior project. Usually at least one project is chosen each year to be produced by the partner company and put into the marketplace. Blockitecture, toy building blocks, created by James Paulius for Areaware (Metaproject 03), is one of that company’s most popular items and is sold all over the world. Paulius has since created several other related products, the most recent being Blockitecture Tower. 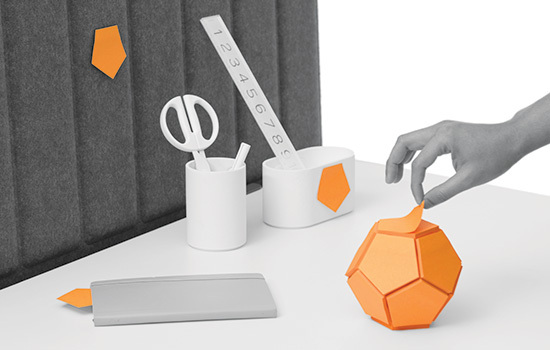 Sticky Memo Ball, a 12-sided sticky-note ball created for Poppin (Metaproject 06) designed by Afifi Ishak ’17, is one of the The Container Store’s top-selling items. Veronica Lin ’17 was part of Metaproject 06, which asked students to create innovative accessories for Poppin’s new line of office furniture. Ultimately, Lin’s product was not chosen to go to market (that year it was Memo Ball) because of the difficulties of using cork, but it was featured in the international design magazine Azure. These were lessons in themselves since the products have to be able to stand up to marketplace scrutiny as well as actual use. The industry partners play a crucial role in helping participants through the marketing and business research part of the program. Students were able to touch and feel the company’s products, take things apart and put them back together, see them in the context of the company itself. Jeff Miller, Poppin’s vice president of product design, said that he was impressed by the “level of inquiry, skill, and technology” that the Metaproject students brought with them. The most recent challenge, Metaproject 08, was different than all the others. Owen connected with RIT industrial design graduate Chuck Cerankosky ’03, co-owner of Good Luck, a high-end restaurant in Rochester named by Esquire magazine in 2016 as one of the top 18 bars in America. Students worked with Good Luck employees to break down the dining experience beginning with customers getting out of their cars, coming through the doors, hanging their coats and having drinks, all the way through dessert and coffee. “Designing Dining” ended up as a successful, curated dining experience for 60 people. Students built on Good Luck’s “inspired table,” a prix fixe menu that it does a few times a year, and came up with a celebration of seasonality as a theme. They broke into teams in charge of sound and lighting, furniture, parking, coat checking, and meal planning. “It was a challenging project but really cool that we could bring industrial design principles into a completely different field,” said fourth-year student Fuijae Lee. Every detail was planned. For example, they determined that coats shouldn’t be hidden away. Coat check became part of the décor, with coats hanging on numbered hangers—which they created and fabricated out of laminate—along guide wires. At one point, a “reverse pickpocket” team slipped cork coasters—that still smelled of burnt wood where they had been laser cut—into guests’ coat pockets. Each course began with a change of table cloth, the last being a heat-sensitive cloth that changed color from the warmth of the cups and plates. Other highlights included a bouquet of salad, specially designed wooden platters that held intricate bamboo skewers during the appetizer segment, and a sauce pen from which diners could add flavoring to their meal. “(The pen) was really trans–formative,” said Cerankosky, who added that the pen and the skewer holder will likely be incorporated into the restaurant’s offerings. Much like any design challenge, the unknowns and the failures are part of the process. Metaproject 06: Afifi Ishakâ€™s Sticky Memo Ball, with 12 pentagonal faces, was a desk accessory presented to Poppin in 2016. Twenty-two students were tasked with creating innovative accessories for the company. 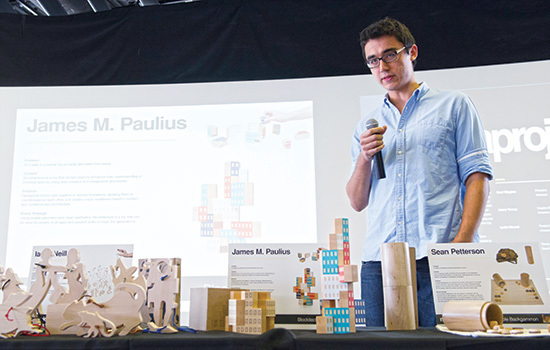 Metaproject 03: James Paulius created toy building blocks called Blockitecture when he participated in Metaproject in 2012-2013. The product is now sold all over the world.